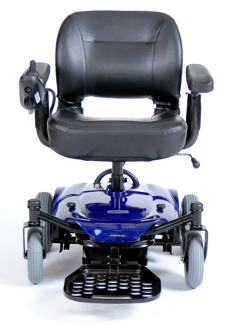 The Cobalt X23 Power Chair by Drive Medical is perfect for users who need an easy and lightweight power chair. The seat even has four height adjustments from 20" to 23". The armrests flip-up to easily transfer the user from one place to another and they are also removable if needed. The armrests are even height and width adjustable for better positioning and user customization. The controller is adjustable in length and can also be mounted to the left or right arm rest allowing the controller to be adaptable for the user. The Cobalt X23 also includes a footplate which can be flipped out of the user's way if needed and can be adjusted in both height and angle. The cobalt comes with a standard positioning belt and armrest-mounted reflectors for security and safety. The tires are flat-free and non-marking which offer a worry free travel and the motor assembly offers easy freewheel operation, allowing the chair to be pushed, which can be helpful for transport. The Cobalt X23 is the perfect solution for anyone looking for a easy to use lightweight power chair.